The two ships spotted each other just before the collision and the captains tried to keep the ships together — that might have plugged the hole in the ship’s side — but Empress of Ireland had too much headway for that. The Storstad’s bow sliced seven and a half metres deep into the starboard (right) side of Empress then the two ships separated. They had seen each other clearly before the fog rolled in but had become confused about each other’s course even though both were signaling. It is difficult to be sure of the direction of a signal in the fog. When Storstad slipped away, water began to pour into the damaged ship and, as she listed heavily to starboard. Water also poured in through open portholes. 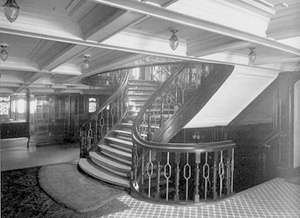 Her rapid list made it impossible for crew members to shut the watertight doors (in effect they were trying to make then go uphill manually) or to launch lifeboats on the starboard (right) side of the ship and the water pouring in also made it difficult for lower deck passengers to climb the unfamiliar and increasingly tilted staircases. [They had yet to get used to moving around the ship because they had boarded only a few hours earlier.] They also had little time. Empress of Ireland turned on her side and sank in 14 minutes. Titanic had floated for more than two hours. However, in contrast to Titanic, those in the few lifeboats that were launched picked up those they could see in the water. Minutes later, when the fog cleared and Storstad could see what was happening, her boats also joined in the rescue. [At first, Storstad was worried about her own survival and her captain, unaware how badly the Empress was hit, was surprised the Empress did not come to check on his boat.] Crew members from Storstad also used two of the Empress of Ireland lifeboats to rescue persons in the water. A few passengers managed to stay alive in the cold water long enough to swim to Storstad. Grand Staircase on the Empress. Although there is slight confusion over the exact number of passengers, the best estimate is that there were 1,477 passengers and crew on board and 1,012 – more than two-thirds — died. However, the death toll was uneven. There were 138 children on board and only four survived. There were 717 third class passengers and 133 were survived. There were 253 second class passengers and 48 survived. There were 87 first class passengers and 36 survived. There were 696 crew and 248 survived. In short crew members were just as likely to survive as first class passengers (Croall, pp: 144-145) and both first class passengers and crew were far more likely to survive than lower class passengers and especially children. Incredibly, one of the survivors was a stoker named William Clarke who had also survived Titanic (Croall, p. 132). Because she had few supplies and little extra clothing on board – her crew including the captain’s wife gave the survivors everything they had — Storstad transferred the passengers she had rescued (including the Empress’s captain, James Kendall) to Lady Evelyn and she took then to Rimouski. There, town residents did their best to clothe them. Many survivors had been in bed when the collision occurred and were wearing only pajamas or night gowns or had no clothing. One survivor covered himself with a newspaper. As more and more bodies were recovered, many had died wearing a life belt so they floated, they were laid out in rows on the dock. Eventually a Canadian government ship, Lady Grey, arrived in Rimouski and loaded 188 bodies for transport to Quebec City where they were unloaded with the help of sailors from the British cruiser, Essex. A special train had brought coffins to Rimouski and it took survivors to Montreal. The incident is best remembered by the Salvation Army because there were 170 Salvationists on board including members of the Canadian Salvation Army band. 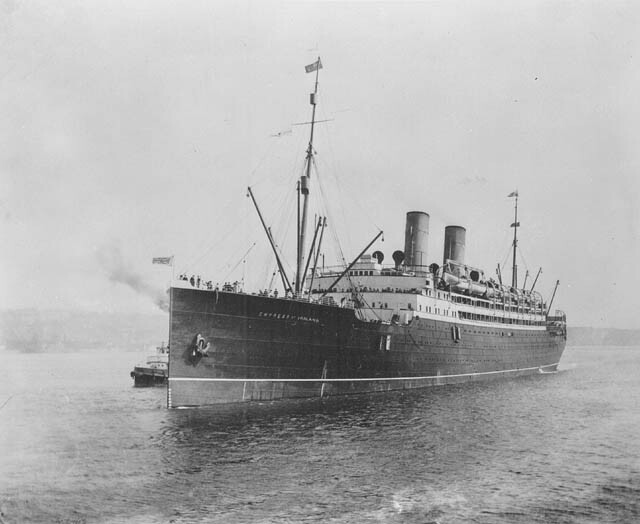 The band had played as the ship departed Montreal just hours before the collision and played a brief concert for steerage passengers that evening, The Salvationists were heading to Great Salvation Army Convention to be held at Albert Hall in London. When it met, 148 seats were left vacant, marking the number of Salvationists lost. A few Salvationists including some band members survived but none had time to gather their instruments and play (as happened with musicians on Titanic) before the ship went down. Unlike Titanic as well, Empress of Ireland had more than enough lifeboats for everyone on board and the crew was well trained in their use. There were also lifebelts for everyone, stored in the passenger cabins though many passengers – since this was the first night of the voyage – were not aware of that. However, the ship listed so quickly that the crew could not launch many lifeboats and it sank so fast – 14 minutes – that there was little time to alert the lower deck passengers who had not been drowned by the inrushing water. Croall, James. Fourteen Minutes: The Last Voyage of the Empress of Ireland. London: Michael Joseph, 1978. Marshall, Logan. The Tragic Story of the Empress of Ireland: An Authentic Account of the Most Horrible Disaster in Canadian History, Constructed from the Real Facts Obtained from Those on Board Who Survived, and Other Great Sea Disasters. S.l: s.n, 1914. Croall’s book is well researched and clear. Marshall’s book, which also deals with Titanic, is less reliable though it does cite some of the testimony from the inquiry. I am a Vice President of the Chelmsford Amateur Radio Society and from 1952 to 1977 Ron Ferguson, OBE, G4VF was our President. We are commemorating the efforts Ron made in 1914 this year in May and am transmitting to the World on 29th May from Chelmsford, England. G0MWT is the Ofcom issued Call-Sign to CARS in Chelmsford. MPL was the Call-sign of the Empress of Ireland. Thanks for letting us know! Although the tragedy of the Empress of Ireland is not as well known as that of the Titanic, I expect that there will be a number of commemorative events this year marking the 100th anniversary of its demise. Hi, My relative Robert Mangham was a passenger who sadly perished on this voyage. My father has the notification card of his death from the shipping company. There is a photo of his family group in the book ” Into the mist “. Gone but not forgotten. Thanks for writing, Dennis. There’s a very active and informative Facebook page about the Empress that you may enjoy: https://www.facebook.com/TheEmpressofIreland. My great grandfather was one of the first persons to go and try to help in the rescue. He was coming back to Pere’s Point docks when the radio operator came running down to the docks, trying to communicate that a ship was sinking. My great grandfather was French knew very little English , which is what the radio operator could only speak was in English . But my great grandfather somehow understood and raced back out as fast as he could to help rescuing survivors, in which he did. This was chronicled in a book I purchased many years and have forgotten the title. The one thing I do remember about the reading of the book they had changed the spelling of his last name, unfortunately I don’t remember how the spelt it the book as I have missed place it over the years, but hopefully I will get the name of the book and reread it again. Hopefully getting his name correct this time. That is why I have always been intrigued about the Empress of Ireland because I know I have somewhat of a connection to what happened. What an incredible story! Perhaps someone reading it will know the name of the book. You might also put a post on the Empress of Ireland Facebook page that I noted above. Thanks for writing! My great uncle Ted Hanagan was the bandmaster of the Salvation Army Staff Band that was on the Empress of Ireland when it sank off Rimouski, Quebec. He and his wife, Edith, drowned. Their small daughter Grace was rescued and annually, in her adult life, placed a wreath at the Empress’ cenotaph in Mt. Pleasant Cemetery. 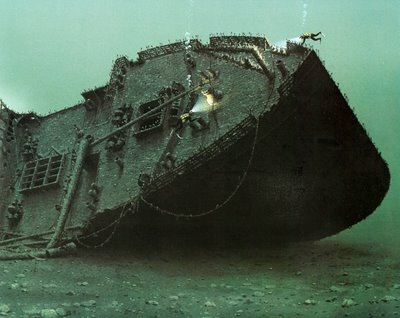 Grace died about 1995, the last survivor of the sinking. I and my sister Brenda are last blood relatives of this Hanagan family. In the 1980s I met a Mrs. Kitchen, she was introduced to me by a common friend.Mrs. Kitchen told me that her parents perished with the Empress of Ireland but she was rescued, I believe she was a baby then. I do not remember her first name but could it be that the “Grace” you talk about could be the Mrs. Kitchen I met. I Would love to know. Thanks for sharing, Dennis. How amazing that Grace was rescued and that she was so careful to commemorate her parents and the Empress over the years! I hope you’re able to figure out who Mrs. Kitchen was as an infant, Marie. It would be very interesting to know!